The Internet is outraged over a major league fashion faux pas. 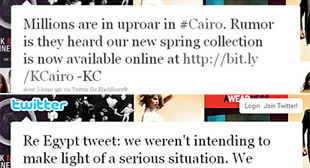 Someone at Kenneth Cole sent a tweet this morning that used the civil unrest in Egypt to promote the fashion house's new spring collection. The tweet, sent out just after 10 a.m. ET, read in its entirety: "Millions are in uproar in #Cairo. Rumor is they heard our new spring collection is now available online at http://bit.ly/KCairo - KC"
The tweet made use of the Cairo hashtag -- #Cairo -- used on Twitter to help people follow the topic more easily, a breach of Twitter etiquette. According to the bio on the Kenneth Cole account, tweets signed "KC" are written by Kenneth Cole himself. About four hours after the tweet went out, Cole deleted it and issued an apology to the media and on Facebook. Reaction on Twitter was swift and overwhelmingly negative, even including a few calls for boycott. The tweet rubbed thousands of people the wrong way -- they denounced it as tone deaf at best, cynically tacky at worst -- for exploiting a democratic movement in which people have died in order to sell shoes and handbags. Already, a parody Twitter account exists under the handle "@KennethColePR," much along the lines of the fake BP publicity account that popped up during the massive Gulf oil spill last year. "Iran is enriching uranium. Our shoes will enrich your suits," reads one of @KennethColePR's less offensive tweets. Shortly after the offending tweet sent thousands of Web surfers into a tizzy, "KC" issued an apology tweet: "Re Egypt tweet: we weren't intending to make light of a serious situation. We understand the sensitivity of this historic moment - KC"
Still, while the Internet's tongue clucking went into overdrive, the markets didn't even blink. On a day where the rest of the S&P 500 was relatively flat, four hours after the kerfuffle erupted, Kenneth Cole shares were up almost 2.5 percent.